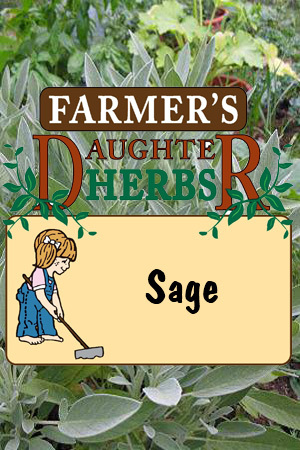 This name sage is derived from the Latin word meaning health or healing powers. Sage has been used as a medicinal herb far longer than it has been a culinary herb. It was indispensable in the Dark Ages. The ancient Greeks and Romans administered sage for everything from snakebite to promoting longevity. Sage was steeped in hot water, as for tea, before tea became known. Introduced to American palettes in the 1800’s, medicinal usage of sage declined as the culinary use increased. It was once believed that planting sage in an herb garden would guarantee immortality. This greyish-green leafed member of the mint family had actually grown into the most popular herb in American cooking until after World War II, when oregano took over as the number one seasoning. Slightly bitter in flavor and highly aromatic, sage is one of the main ingredients in poultry seasoning. It enhances meats and poultry as well as most vegetables. Fresh sage is far less bitter than dried sage but in either form, a little goes a long way. It is not particularly palatable fresh so add it sooner in the cooking process rather than near the end as with most fresh herbs. Sage will stand up to long cooking times making it a natural for stewed or braised dishes. The shrubby sage plant is native to Mediterranean regions although it is now cultivated in a wide range of locales including California, Washington, Utah, and Oregon. More than 900 varieties of sage exist. 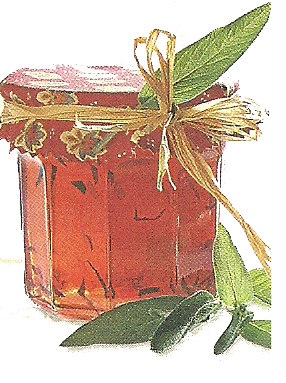 Sage jelly compliments meat dishes and makes them more digestable as well. Simmer 1 cup of red wine and the juice of 1 lemon in a double boiler for 5 - min. ; remove from heat. Add 4 - 6 whole sage leaves; steep for 20 min. and strain. Pour the mixture back into the double boiler, and add 3 cups of unsweetened applesauce. Simmer over very low heat until the jelly thickens (10 - 15 min.). Add 1 - 2 tbsp. honey for taste and a sage leaf for appearance. Refrigerate and use on meat for up to 2 weeks. Try this served with eggs for Sunday Brunch! 2 tbsp. finely chopped sage . Mix sausage meat and sage together in a bowl. Form into small patties. Fry in a skillet for 5 minutes per side until browned. Serve.